Head to Franklin County and leave life behind for the afternoon or weekend. 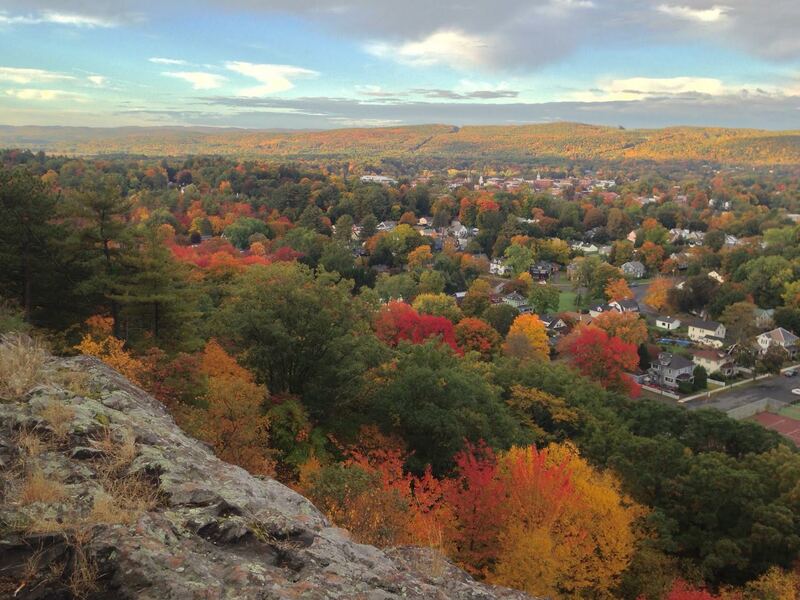 Take to the rolling hills, meandering river valleys, and charming towns of western Massachusetts to unwind. Here are eight transcendent views to start you off. 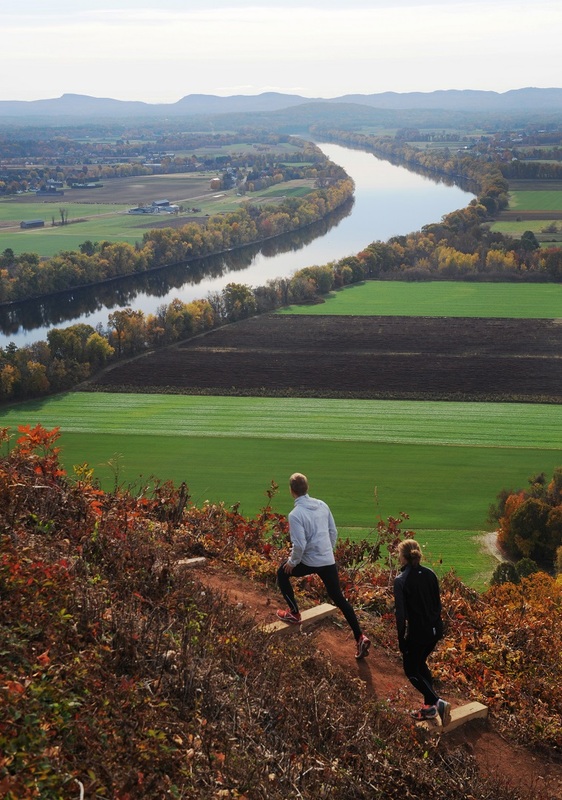 Whether you arrive at the top of Mount Sugarloaf’s south summit by driving (just a few minutes) or walking (about a half-hour) up the winding auto road, or by hiking up one of the marked trails, once the Connecticut River comes into view you’ll have no doubt that agriculture is alive and well in this valley. Lined with trees and productive farmland, and an occasional red barn and white steeple in the distance, this spectacular and quintessential rural New England view is both serene and inspiring. Before it was called Sugarloaf (sugar was once molded into cone-shaped loafs for shipping), the indigenous Pocumtuck people called the mountain Wequamps, believing it was a giant greedy beaver killed by the god Hobomok and turned to stone. The south summit is the head, the north ridge its back. Directions and information about picnicking, trails, and parking here. Visit Historic Deerfield, an authentic 18th-century New England village. Tour beautifully restored museum houses with period architecture and furnishings, see demonstrations of colonial-era trades, and explore world-famous collection of early American crafts, ceramics, furniture, textiles and metalwork. 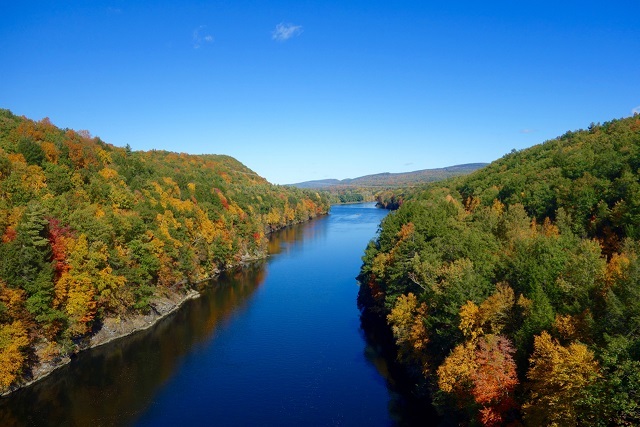 If you are traveling on Rt 2 you are definitely going to want to pull over when you reach the French King Bridge for its beautiful form, impressive height, and breathtaking views of the Connecticut and Millers Rivers and surrounding landscape. This steel three-span cantilever arch bridge over the Connecticut River, connecting Gill to Erving, opened for travelers in 1932 and won the American Institute of Steel Construction’s Most Beautiful Steel Bridge Award. From the parking area at the end of the bridge, you can walk to the center and take in the view of the river winding through a dramatic undeveloped landscape including the Wendell and Erving State Forests. For a view of the bridge itself, follow the path down the bank. Get a hearty meal at the French King Restaurant right next to the bridge and then head out to the Erving State Forest or Wendell State Forest for hiking, XC skiing, snowmobiling, hunting, and water sports. 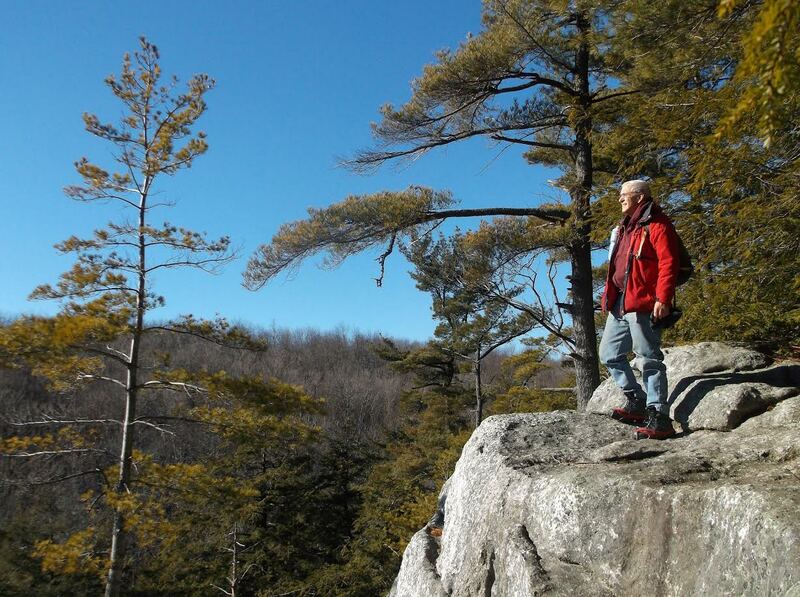 If you’re the type of hiker who is all about the view, then High Ledges is the hike for you. You can park your car at one of the clearly marked parking lots and take the 1-mile moderate trail straight to the overlook. The trail meanders through fields of wildflowers, where birds, butterflies, and other critters can be seen. Large rocks create perfect seats to gaze at the 3-directional view of the Village of Shelburne Falls, the Deerfield River Valley, and Mt. Greylock in the distance. If you can peel your eyes away, you will also see a large chimney, the remnants of Dutch and Mary Barnard’s cabin. After reaching the summit, you can continue hiking on the series of trails. The trails all loop around, so you can pick the distance you would like to do. Directions and more information here. 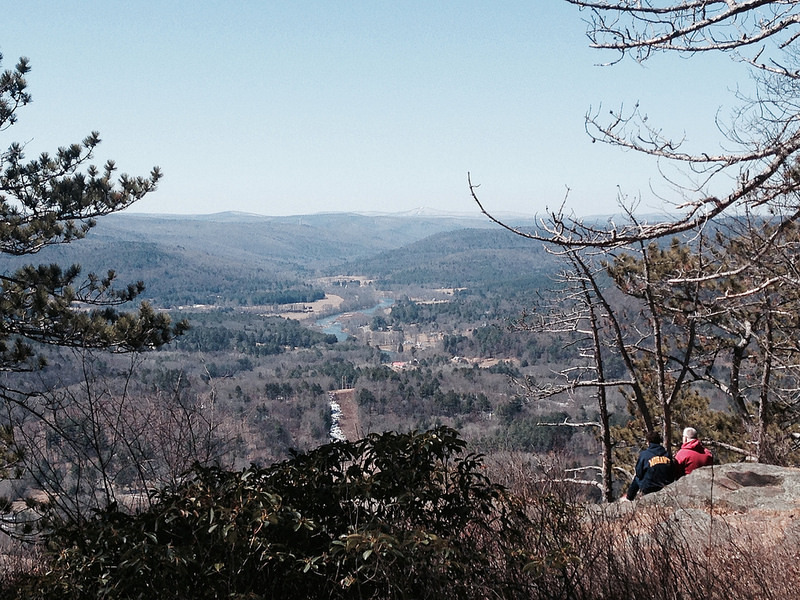 You’ve just seen the Village of Shelburne Falls from a bird’s eye view, now see it up close. Head west on the Mohawk Trail and turn left at the Sweetheart sign to get to the village. There you can check out the amazing art galleries and shops, find a good book at any of the 3 bookstores, and eat quality fresh food at any of the restaurants or cafes. See what else is happening in the village and the surrounding hilltowns at shelburnefalls.com. 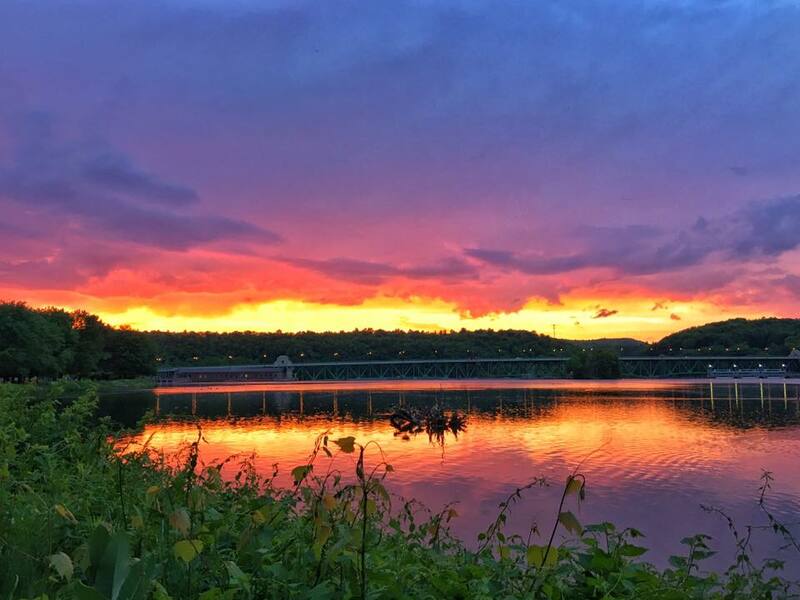 Across the Connecticut River from Barton Cove, Turners Falls has no shortage of great waterfront views. Unity Park is the ideal place to picnic and observe migrating birds and fall foliage as well as glorious sunsets behind the Gill- Montague Bridge. It is also a spectacular vantage for full moon and eclipse events with an unobstructed sky and shimmering moonlight frosting the water. A short walk along the scenic waterfront bike path winds you around to the canal view complete with 19th century mills, smoke stacks, and post-industrial vistas. Enjoy a long western vista from the beautiful 1912 sandstone structure Poet’s Seat Tower, so named for the area’s attraction to poets such as Frederick Goddard Tuckerman long before the tower was built. Reach Greenfield's topmost point by hiking or by walking up a paved road then climbing winding staircases in this peaceful location conveniently located to downtown. From Main Street, turn left onto High Street and turn right at Maple Street. At the end, bear right to the top of the hill. There is a parking area on the left and you can walk up to the Tower. Visit Greenfield’s newly minted Crossroads Cultural District downtown for eclectic shopping, eating, and entertainment. Favorite eating spots include fresh New England seafood in the dining room or outdoor patio at Pete's Seafood or everyday-special locavore fare and modern cocktails for lunch and dinner at Hope & Olive. Browse John Doe, Jr. Used Records and Books for just the right music or visit one of the oldest family-run department stores in the country, Wilson’s. At night, hear all kinds of music at the Root Cellar or Hawks and Reed Performing Art Center. Book at room just a short walk from downtown at the Brandt House B & B for a magnificent turn of the century estate perched on a hillside. What tour through scenic beauty would be complete without a waterfall? This special spot, managed by The Trustees of Reservations, indulges you in waterfall splendor with a minimal trek to get there. 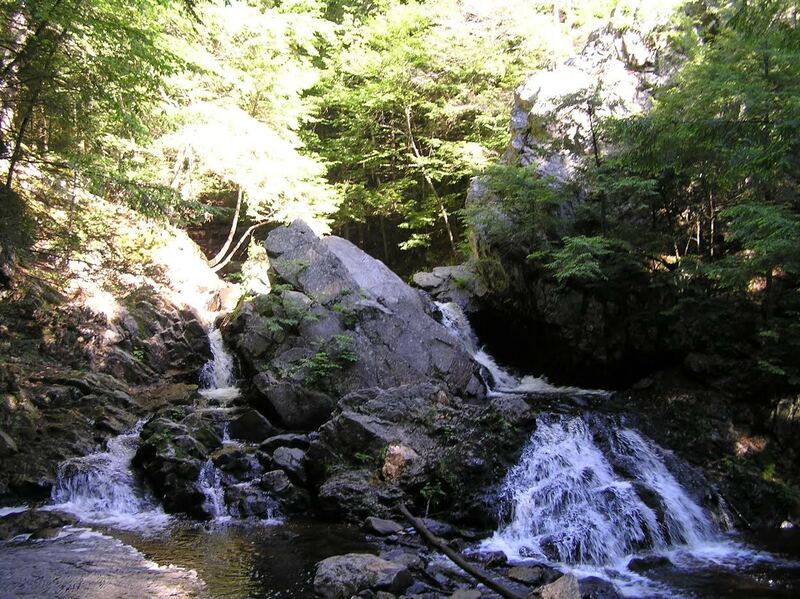 According to The Trustees, “on its way to the Quabbin Reservoir, the Middle Branch of the Swift River cascades into an intriguing woodland pool at the bottom of a secluded gorge. Here, along a short, quarter-mile trail, you have two choices: go to the left and you can explore the enchanting waterfall; head to the right to follow the stream as it tumbles through large boulders past the site of an old mill." Directions and info here. They also explain that "...in 1675, the great chief Metacomet (known to European settlers as King Philip) met here with neighboring chieftains to plan attacks on Hadley, Deerfield, and Northampton. A black bear shot on the property gives the reservation its name." If one waterfall were not enough, here’s another coupled with panoramic views of the Highlands and foothills of the Berkshires. If you want a strenuous hike you’re in luck but there is also an easy way up. Chapel Brook is also among the impressive sites managed by The Trustees . As they describe it, “We think it’s the rugged beauty of the landscape, like much of the Highlands a blend of steep and deep forests, sensational summit views, and streams that surge and trickle with the seasons. The brook is tranquil – except when spectacular Chapel Falls are in full roar! – and rugged Pony Mountain has a kick. Although Pony Mountain is only 1,420 feet high, the hike to the top is exhilarating. The Summit Trail rises to meet the abrupt, vertical, 100-foot rock face of Chapel Ledge (which attracts experienced rock climbers). You’ll want to be in good shape to tackle this trail. A less-daunting, half-mile trail leads around the western side of Pony Mountain to its summit." Info and directions here. Get a Big Time Breakfast at Elmer’s, where half the fun is the charmingly amusing menu. Take in Northfield's classic New England architecture or treat yourself to a wine tasting at Cameron’s Winery. After reading about all of Northfield's attractions, you may want to extend your stay at Centennial House B & B. Too tired for another hike? 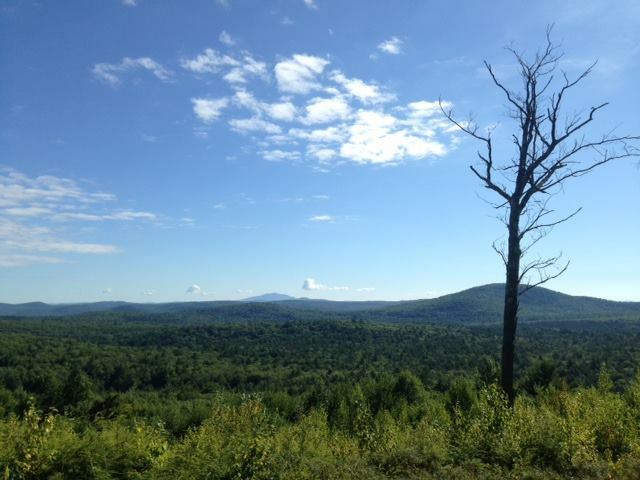 Come back for biking, boating, skiing, and hiking at Northfield Mountain. Franklin County has much to offer throughout the year. Find out more! Sign up here to get articles like this delivered to your inbox.